George Eumorfopoulos (1863 -1939) was a renowned expert on Chinese antiquities and founder of the Oriental Ceramic Society. His collection forms the basis of holdings in this area at the V&A and the British Museum. G.F Watts was one of the leading portrait painters of the Victorian era. 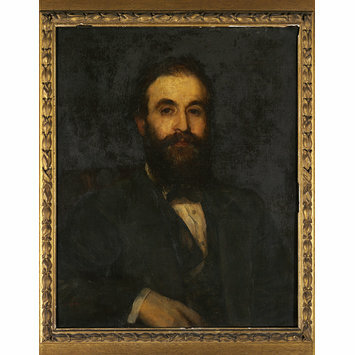 The portrait of Eumorfopoulos was painted at the end of Watts' life. 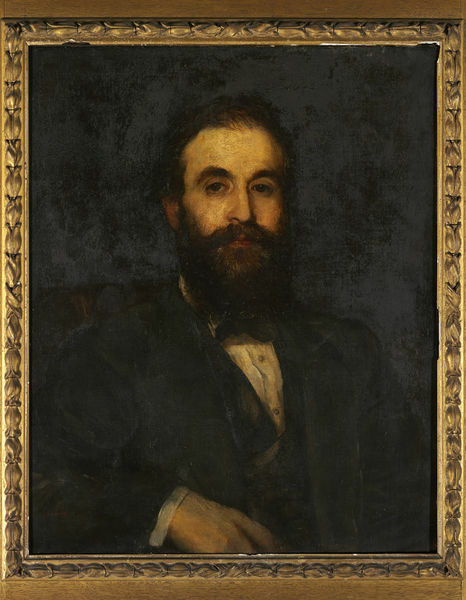 It is likely that the Anglo-Greek art collector and V&A benefactor Constantine Ionides (1833-1900) introduced Eumorfopoulos to Watts, as the Ionides family had been loyal patrons of Watts since the late 1830's. An oil on canvas portrait of George Eumorfopoulos. The frame is rectangular and in the original Watts style, made of gilded wood and composition.